AMMAN — Environmental activists on Monday expressed anger over a newspaper ad offering a plot of land in Dibbeen forest in Jerash Governorate for sale at auction. The land, which has been offered for sale at auction, is the original site of a comprehensive tourism complex which was built in 2009 under an agreement between Jordan Dubai Capital and the investment unit of the Social Security Corporation, according to environmentalists. 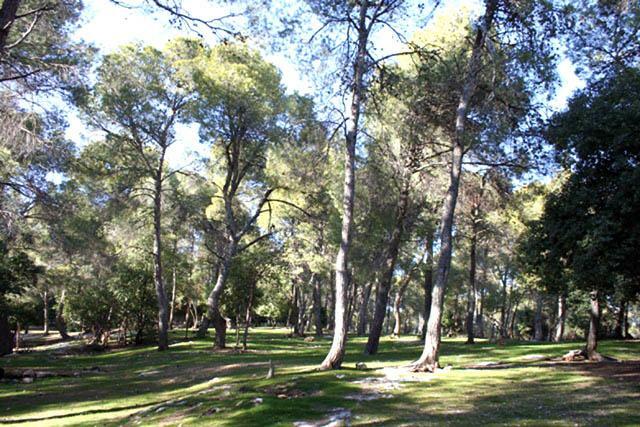 Construction of the multimillion dinar tourist resort in Dibbeen forest generated a strong wave of objection by activists and the public, who claimed at the time that the project would harm the forest and the ecology of the area. In the ad, which appeared in a local newspaper late last week, the land and all of its trees and buildings were offered for sale at auction. The ad provided details on the number of the land’s trees, their age and the estimated price of every tree. The Jordan Agricultural Engineers Association (JAEA) said that offering trees from the Dibbeen forest for sale at auction was a “shock to Jordanian society, which values trees”. “We feel pain for the situation of those centennial forest trees in that area, which some people promised would be heaven on earth, but it turned out to be a shameful failure,” JAEA President Mahmoud Abu Ghnaimeh said. Abu Ghnaimeh said that a strong will is needed to end the destruction of the future of coming generations. Meanwhile, the Jordan Federation of Environmental NGOs denounced any sale of the land and its trees at auction, calling for changing the description of the land’s use, from investment to forestry. “The land’s use description was altered from forestry to investment to allow the project to proceed and that was a violation. Now that the investment project stumbled and that its land is offered for sale at auction, we call for reverting the land’s original use description,” the federation’s President Omar Shoshan urged. A total of 8,000 trees, including Greek juniper, maple and oak, are offered for sale at JD931,845, according to Shoshan. He also called for referring the project’s file to the Anti-Corruption Commission, alleging that corruption and violations of the law were involved “since the beginning”. At the time, environmentalists had said that the project was in violation of the 2007 land usage regulations, which prohibit construction in any area where tree density is over 30 per cent, indicating that the rate is between 85 to 90 per cent at the Dibbeen forest. The federation is planning a media campaign and said it will address the Environment Committee in Parliament. “Environmental NGOs have a unified stance on this issue. We are going to resort to court if the demands are not met. We demand that the government corrects its mistake,” Shoshan highlighted. Minister of Agriculture Khaled Hneifat noted that the ad provides prices for the contents of the land offered for sale at auction, but indicated that the ministry will not allow the cutting of trees. “All trees across the Kingdom are property of the Ministry of Agriculture, whether on private or public lands, and anyone planning to cut down a tree must take the approval of the ministry… we will not allow cutting down any tree in Dibbeen,” Hneifat said in a statement e-mailed to The Jordan Times on Tuesday. Located in Jerash Governorate, 48 kilometres north of Amman, the Dibbeen Forest Reserve was established in 2004 with the aim of protecting Aleppo pines, especially since Dibbeen is the driest place in the world in which Aleppo pines grow naturally, with an average rainfall of around 400 millimetres per year, according to the Royal Society for the Conservation of Nature.